Hue - Another name for color. Hue refers to the color family, such as red, blue, or yellow. Shade - A color or hue that is mixed with black or gray. Tint - A color or hue that is mixed with white. Value - The relative lightness or darkness of a color. Intensity - Or chroma, refers to a color's purity or brightness and conversely, its dullness. The purer, or less gray, the more intensity. Bright yellows or cherry reds have high intensity. Temperature - We perceive color in two basic temperatures, warm and cool. 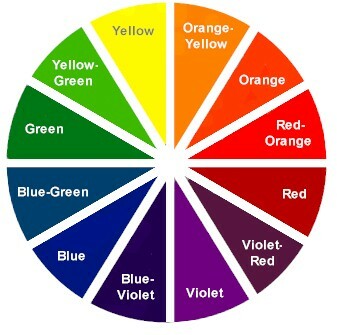 Generally, reds, yellows, and oranges are warm colors and blues, greens, and violets are considered cool. Years of research tell us that color effects us both physically and mentally. Each color communicates differently with our emotions ranging from tranquility to rage. When selecting colors, ask yourself what mood you're looking for. Below, you'll find tips to help you create that mood. This powerful color increases blood pressure and heart rate. It often produces feelings of intimacy, energy, passion and sexuality. It also stimulates the appetite and is often used in restaurants and is an excellent choice for dining rooms in the home. Like red, orange warms a room but in a less dramatic and passionate way. The mood and attitude of orange is more friendly than fiery; more welcoming than seductive. Orange works well in living rooms and family rooms and is also a good choice for children's bedrooms. Yellow grabs attention and catches the eye like no other color, hence the use of yellow highlighters in offices. In poorly lit foyers and hallways, yellow shows the way. In their bedrooms, elderly people report that yellow lifts their mood. But bright yellow can be too strong and may actually cause anxiety in infants, young children and the elderly. Soothing blue is an ideal bedroom color choice for adults and children. But that same blue that lulls us to sleep also suppresses our appetites, possibly because there are very few naturally blue foods. Put blue to bed, but try and keep it out of the dining room. As the dominant color in nature, we are at home with green anywhere in the house. Light greens work well in baths and living rooms; mid-range greens are a great accent for kitchens and dining rooms. The calming effect of green makes it popular in hospitals, schools and work environments. Despite the favorable response violet elicits in children, many adults dislike purples, with rosier shades of violet being somewhat more appealing. Children's bedrooms and play areas may be good places to experiment with this color family. Color looks different under different light sources. If you've ever been picked colors in a paint store and did not test them under you light conditions, you've probably experienced this. The technical term for this is metamerism, the occurrence of colors seemingly changing when viewed under different light sources. We highly recommend viewing colors in the actual space before purchasing your paint. Below are some examples of how different colors can appear under different light conditions. Notice below, the exact same space, with the exact same colors. The only difference is the LIGHT! Considered the ideal light source, natural sunlight maintains a neutral balance between both the warm (yellow case) and cool (blue cast) ends of the light spectrum. Northern light is the coolest, while light from a southern exposure is the strongest. Here, direct sunlight provides the “truest” rendition of the colors in this room. Natural sunlight is not consistent. It changes from sunrise, to noon, to late afternoon and dusk. The intense golden rays and subsequent distinct shadows of a sunny, late afternoon have a profound effect on the colors in this room. Monochromatic - Color schemes that use tints and shades of the same color. Complementary - Includes two different colors that are opposite each other on the color wheel. Looking at the color wheel above, yellow and purple are directly across from eachother, making them complementary. Analogous - Uses consecutive colors on the color wheel. Create a pleasing palette by using one color more prominently than the other two. Triad - Includes any three colors equally spaced on the color wheel. Interior designers and professional painters do a "brush out" when deciding on color. They apply paint to a small section of the wall or several walls to see how the color looks in the actual environment.By sampling a color at home, you will get the most accurate sense of how the color will actually look in the room.